Fort Wayne, Indiana – An Indiana intellectual property attorney for Global Archery Products, Inc. of Ashley, Indiana commenced litigation in the Northern District of Indiana alleging trademark and patent infringement by Jordan Gwyther d/b/a Larping.org and UpshotArrows.com of Seattle, Washington. Two patents are at issue in this lawsuit: U.S. Patent No. 8,449,413 (the “`413 Patent”) and U.S. Patent No. 8,932,159 (the “`159 Patent”). Both are entitled “Non-Lethal Arrow.” Also at issue are U.S. Trademark Registration No. 4,208,867 and 4,208,868 for ARCHERY TAG for use in connection with non-lethal arrows. The patents and trademarks have been registered by the U.S. Patent and Trademark Office. 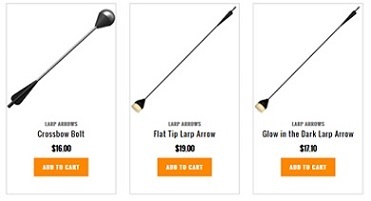 Global contends that Jordan Gwyther d/b/a Larping.org (“Larping”) is selling and offering for sale several products including a “Crossbow Bolt,” a “Flat Tip Larp Arrow,” a “Glow in the Dark Larp Arrow” and a “Round Tip Larp Arrow.” These arrows are marketed at www.upshotarrows.com. Global asserts that Larping is violating Global’s trademark rights by, inter alia, using the ARCHERY TAG trademark on advertising and as a paid “key word” on one or more search engines in connection with the marketing of these products. Global also claims that Larping’s products infringe upon two of Global’s patents. Global seeks equitable relief along with damages, including punitive damages, costs and attorney fees. The case was assigned to Judge Joseph S. Van Bokkelen and Magistrate Judge Susan L. Collins, in the Northern District of Indiana and assigned Case No. 1:15-cv-00297-JVB-SLC.